ClotCare FAQ: What are graduated compression stockings, where do I get them, and how do I put them on? What are graduated compression stockings, where do I get them, and how do I put them on? Ruth Morrison, R.N., B.S.N., C.V.N. Graduated compression stockings are special stockings that help promote circulation in your legs. In your leg veins, blood must flow upward to the heart. Graduated compression stockings apply a certain amount of pressure near your ankle and then apply gradually less and less pressure as they move up the leg. In this way, they help to squeeze or push blood back up the leg from the ankle to the thigh in an effort to counteract pooling of blood in the leg and the resultant swelling. Graduated compression stockings are made for both men and women, and the come in various versions such as knee highs, thigh highs, and pantyhose. They are prescribed in millimeters of mercury (mmHg), which represents the amount of pressure put on your legs by the stockings. The gradient pressure is strongest at the ankle and decreases up the leg. Your healthcare provider will prescribe what version and pressure is right for you. Proper fit is essential for stockings to work effectively. Measurements should be taken accurately to ensure a proper fit. So, why would I want to wear graduated compression stockings? For patients who have had a blood clot in their leg (deep vein thrombosis, or DVT), graduated compression stockings have been shown to reduce the risk of developing post-thrombotic syndrome and the risk of having another DVT. Post-thrombotic syndrome is a painful condition developed by some patients who have had a blood clot in their leg. You can learn more about post-thrombotic syndrome by reading our FAQ on post-thrombotic syndrome. Post-thrombotic syndrome is sometimes referred to as chronic venous insufficiency (CVI) or as post-phlebitic syndrome. Graduated compression stockings can also be used to help reduce the swelling for patients who have developed post-thrombotic syndrome. In some instances, graduated compression stockings may be used to help prevent a DVT from occurring in a patient who has never had one. For example, a physician may have a patient wear graduated compression stockings after surgery or when bedridden to help promote circulation. How do I put on graduated compression stockings? How and where can I get graduated compression stockings? First talk to your healthcare provider to find out if graduated compression stockings are right for you. If they are, your healthcare provider can tell you what pressure grade you should buy. Additionally, your healthcare provider may be able to recommend an authorized vendor that can measure and fit you for the stockings and can provide education regarding compression therapy. Authorized dealers may be able to bill your insurance company for reimbursement. Although it is ideal to be custom fit by an experienced fitter, we understand that doing so may not always be possible. Your healthcare provider may be able to help fit you for the stockings. Alternatively, if you need to determine your size on your own, there are a couple vendors with online resources that can help. Foryourlegs.com is a Michigan vendor that provides useful measuring instructions online that you can follow with the help of a friend. This measuring guide is located at http://foryourlegs.com/pages.php?pageid=11. HealthyLegs.com is a vendor near Portland, OR that provides an instruction video on taking your measurements. The video is available at http://www.healthylegs.com/howtomeforsu.html. Once your healthcare provider has prescribed a specific pressure grade and you have been properly fitted for your stockings, you may be able to purchase stockings at your local pharmacy, or you can purchase them online. Foryourlegs.com and HealthyLegs.com offer a discount for ClotCare visitors. If you decide to purchase graduated compression stockings from Foryourlegs.com, enter coupon code "clotcare" at checkout to receive free shipping on any order of $25.00 or more. If you decide to purchase stockings from HealthyLegs.com, enter coupon code "ClotCare" at checkout to receive 15% off your oder. 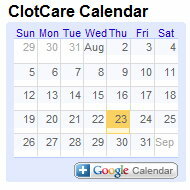 Please note that ClotCare is not affiliated with nor financially compensated by Foryourlegs.com or HealthyLegs.com, and we have provided this information "as is" because we think it may be useful to ClotCare visitors. Finally, you can check the manufacturer's website to find retail locations near you. Links to the websites of some common manufacturers are below. If you would like more information on this topic and/or would like to see a demonstration of how to apply graduated compression stockings, you may review a video on this topic at www.venousdisease.com/comptherapy.html. Please note that this video was made for healthcare providers, so there is a considerable amount of medical language used. The video is narrated by Joseph A. Caprini, MD, MS, FACS, RVT and is part of his website www.venousdisease.com.